This was the first in a body of work based on views of the artist’s studio at the time, an old stable in Fitzroy, Melbourne. ‘I have spent the last few years looking at the immediate environment in which I live, both interior scenes and inner city spaces …’ (Peter Bonner, 1997). 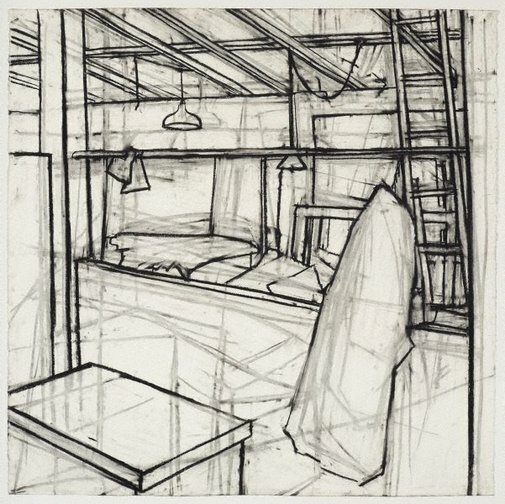 'Interior' reveals Bonner’s pared-down approach to drawing, in which changes that result from erasing and refining charcoal lines leave ghostly traces on the paper, all contributing to the final image. This work won the Dobell Prize for Drawing in 1997 and was acquired by the Gallery in 1997. Signed and dated l.r. verso, compressed charcoal "PETER BONNER/ INTERIOR '96". Sonia Barron, The Canberra Times , 'Balancing the old and the new’, pg. 3, Canberra, 06 Aug 1997, 3. Jackie Blondell, Accountancy Magazine , ‘Not many people know him’, pg. 54, Sydney, 01 Feb 1998, 54. Hendrik Kolenberg, Contemporary Australian Drawing: 20 years of the Dobell Prize for Drawing , ‘Introduction’, pg. 6-14, Sydney, 2012, 9, 28, 29 (illus. ), 60. Hendrik Kolenberg, The Dobell Prize for Drawing: 1993-2004 , ‘Introduction: the first ten years’, pg. 8-9, Sydney, 2004, 5 (illus., detail), 24, 25 (illus. ), 50, 52. Robert Nelson, The Age , ‘Left feeling a little drawn’, pg. 7, Melbourne, 28 May 1997, 7 (illus.). Nicola Webber, Herald Sun , ‘Art win eases painter’s pain’, pg. 9, Melbourne, 22 Mar 1997, 9.